California ranks as the country’s second-best state to be single, boosted by its opportunities for romance and fun. San Francisco has been named the best American city for celebrating Valentine’s Day in 2019. Los Angeles also ranks in the top 10 in the country for Valentine’s Day-friendliness. no better city in America to celebrate Valentine’s Day than San Francisco. That’s according to a pair of recent reports from WalletHub, both of which rank U.S. states and cities on 100-point scale based on their dating- and Valentine’s Day-friendliness. The first study measures the best states for singles based on dating opportunities and economics, romance, and fun. The second report uses a combination of costs, activities, gift accessibility, and weather to determine the top cities in which to celebrate Valentine’s Day. 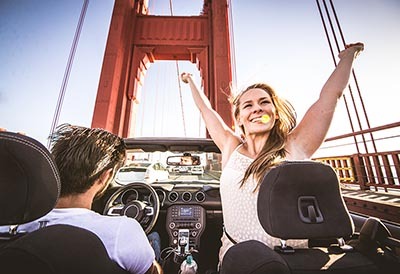 California ranks as the nation’s second-best state for singles behind Florida in 2019, with a score of 67.10 The state is tops in America for dating opportunities and No. 2 when it comes to romance and fun, which includes factors such as nightlife accessibility and number of parks and attractions. California ties several other large U.S. states — including New York and Texas — for the most restaurants and movie theaters per capita. And if you’ve already met that special someone, a mid-February trip to San Francisco may be in order, as it ranks as America’s best city for celebrating Valentine’s Day, scoring a 75.62. San Francisco ranks No. 2 in the country for activities for couples but falls near the bottom of the 100 cities included in the report for weather, as February is typically one of the rainiest months of the year in the Bay Area. San Francisco ties several other cities for the most chocolate shops per capita in the country and ranks in the top five for most jewelry stores per person. Los Angeles also cracks the top 10 for Valentine’s Day-friendliness with a score of 66.37 and ranking second overall for accessibility to gifts. Like San Francisco, Los Angeles has among the country’s highest concentration of jewelry stores but also ties New York City and Miami for most florists per capita. A final note about Valentine’s Day: Remember to watch your budget when spending on your sweetheart. A recent LendingTree study found that the average American man plans to spend $95 on Valentine’s Day this year, more than double what their partners expect. And spending too much on this holiday can add strain to a relationship, as 25 percent of both men and women said that they would be irritated if their partner went overboard for Valentine’s Day.